Found an amazing spot of much needed levity on Twitter today. 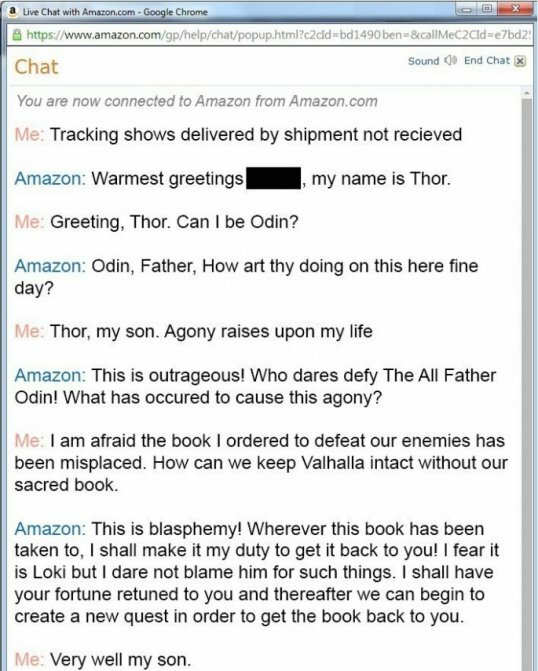 Seems someone named Thor works in the Amazon customer service department. Suspend reality with me for a moment. Look what happened when a customer decided to “be” Odin in a live customer service chat session. Amazon does have great customize service. But this was epic. I saw it on Paul Szlorda’s Twitter feed. And then he turned it into a piece for Tech Insider. Ha! Small things entertain me no end.